Robotic process automation (RPA) is the application of technologies to configure computer software or a “robot” to capture and interpret existing applications for processing a transaction, manipulating data, triggering responses and communicating with other digital systems. RPA combines intelligence including natural language processing, machine learning, autonomics and machine vision with automation. Software named as robot captures and interprets the customer requirements and initiates operations across multiple digital systems. These software bots which perform these activities can also be termed as virtual or digital workforce in today’s work environment. Robots are likely to be performing 45% of manufacturing tasks by 2025 (vs. 10% today) . Merrill Lynch estimated the robots and AI solution market at US$153b by 2020. Machine learning and customer interface such as voice and facial recognition will bring a huge change in the banking and financial industry. Roboadvisors are a major technological disruptor for traditional wealth management and have the potential for US$255bn in assets under management (AUM) by 2018, implying >100% CAGR, or 2% penetration of the total addressable market . Banks are looking for different ways to stay competitive and maximize profit with a reduction in cost. RPA are starting to change the way Banking, Financial Services and Insurance (BFSI) is doing business. The concept of robotics automation involves the combination of intelligence with automation. RPA can produce vast information, data, analysis and workflows which have proven to provide tangible benefits to banks as well as its customers. Over the past years, various acquisitions and mergers happened which led to an increase in competition in the banking industry. Banks are investing in RPA to keep up with constantly changing and competitive industry. Automated investment programs use algorithms to arrange individual investment portfolios. Digital investment solutions can help strengthen the relationship between credibility and service provided . High volume and repetitive tasks are better performed by robots. It improves service quality, high accuracy, faster turnaround time, multi-tasking and increases compliance. The banking industry is under pressure to provide 24/7 services, their profit margins are going down and customer satisfaction surrender. RPA is today’s version of tech outsourcing. RPA is quick and cost effective with tangible return on investment (ROI) for banks. The more automation and reliability banking can bring into the customer experience, especially on mobile devices, will define the industry’s success for many years to come . Robots help manufacturing industry by increasing production with improved quality, process, and backend work. Banking sector now has years of data related to customer feedback, products and bank activities which can be further analyzed with the help of Business Intelligence (BI) tools and help in strategic decision-making. RPA can allow banks to monitor customer behavior, workforce efficiency and time taken to complete various banking operations from anywhere. Banks have put AI as a key element of daily operations and believe AI can be key to enhancing customer experience. The primary objective behind exploring and building the RPA capability is to overcome the barrier of human intelligence scalability. The speed with which humans can perform the given tasks compared to the Robot has surpassed by performing the same task in a fraction of a second. RPA looks to overcome this very challenge with human intelligence by transferring the human intelligence to cognitive machines with supreme computational capabilities. It is the proxy for future banking workforce and customer service. It can better perform repetitive tasks, with higher accuracy, faster turnaround. In the evolution of the banking service industry, top performing banks are investing in this technology with the expectation of significant reduction in the cost of their operations. At the same time, business customers’ adoption of this technology is important for the success of RPA in the banking industry. Technology is changing at a fast pace and people find it difficult to trust technology which is controlled by bots. When customers are satisfied with technology adoption, the benefits of technology are likely to be higher and more effective. The most challenging issue in the adoption of new technologies is understanding the attitude of customers towards new technologies. What are the key factors that influence the adoption of RPA in the retail banking industry to enhance the customer experience? Our research follows a quantitative approach with a strong empirical analysis to identify the key factors influencing RPA adoption in retail banking industry to enhance customer experience. A survey questionnaire, designed with research items was sent to the appropriate stakeholders like banks’ customers, IT professionals, analysts, senior management decision-makers and and industry experts to get their responses and better understanding of the problem from a customer’s perspective. Demographical items were also included to understand the responses better. The study was carried out with samples collected mostly from the Asia Pacific Region. There are three significant contributions of this study. First, this research focuses on RPA technology which has not yet drawn enough IS research attention. As RPA research in the domain of IS is sparse, this study contributes theoretically by setting the foundation for future research in this area. Second, To the best of our knowledge, this is one of the foremost to explore adoption factors of RPA from a customer perspective. Third, by hypothesizing the effect of different identified factors, we restate the need for a thorough understanding of these antecedents for a successful adoption of RPA technology in the retail banking industry to enhance customer experience. Holistically, this study, by depicting the RPA adoption factors, will contribute to the field of retail banking and help in understanding technology adoption from a customer perspective. The revolution of the industry and its achievements are so numerous that their impact can hardly be overrated. Robotics research, aimed at finding solutions to the technical necessities is now focusing on human expectations and needs to meet the demanding customer market. Any task which is definable, repeatable and rule based is a good candidate of automation by RPA such as closing and opening of bank accounts and handling various processes in the customer service department. RPA results in efficient and error free service, improves compliance management, expedites repetitive office tasks at a much faster rate and improves business process along with service quality. Hence, cost is reduced and customer experience is enhanced [4,5]. Employees can participate in more value-added services that involve customer interaction, solutions and decision-making. This will allow banks to offer the best experience to their customers. As employees can focus on more customer facing roles, it is most likely to enhance customer satisfaction, acquisition and retention. The ability to collect and mine vast data and provide a complete audit is especially useful in areas like compliance and regulatory reporting. High volume, manually intensive, prone to risks and human errors processes are prime candidates for RPA. When it is enabled with AI, it can virtually eliminate processing errors, hence, improving accuracy and efficiency. Retail banking is a service industry focused towards the customer’s money and its management . With the increasing competition in the retail banking industry and rapid technological evolution, how do banks innovate to meet these challenges? Technological innovation in the retail banking industry was spurred on by the need to reduce cost and increase performance. Cost savings came largely through back office automation. Online banking or internet banking, which allows customers to monitor and perform various financial transactions is widely used. Over the past two decades, remote access has migrated from the telephone to the personal computer and most recently to the mobile smart phone . Most recently, with innovation in technology, banks are considering the adoption of RPA to automate repetitive processes. The most important force of change in the banking industry is the rapid evolution of customers wants and desires. Customers are demanding anytimeanywhere delivery of financial services with an increased variety of products and services. Today, banks cannot deny the unprecedented benefits derived from implementing and adopting RPA tools in their environment. This includes corporate banking, retail banking, wealth management and other banking related services involving customer interaction. With the implementation of RPA, it enables Banks to achieve customers’ demands. Cost and fees charged by banks from its customers is one of the factors influencing customer satisfaction . Perceived ease of use and perceived usefulness are the factors affecting intentions to use the Smartphone banking services . Perceived usefulness, and attitude are the most significant drivers of intentions to adopt m-banking services in developed and developing countries . RPA will allow banks to dramatically reduce processing time and enhance customer service with higher accuracy. Banks will be able to handle large volume, repetitive and tedious jobs with the same resources. They can also learn how to improve performance and accuracy with little or no human input. In addition, multi-lingual language processing and voice recognition capabilities allow robots to interact and conduct seemingly intelligent conversations with customers. From the literature review, it is understood that new technologies have been introduced in the retail banking services sector. In order to stay competitive, banks will have to adopt these new technologies to reap the gains which includes reduction in cost, increased performance and improved customer experience. RPA has penetrated the Healthcare, Insurance and Telecommunication industries. Customer readiness is also a contributing factor for the successful adoption of a new technology. This study would consider the challenges of enhancing the customer experience through the adoption of RPA in the retail banking industry. The factors (independent variables) identified are security and privacy, reliability, usefulness and human-like interaction. Details on the independent variables referenced are covered in the Research Model and Hypotheses section. Figure 1 is the research model on which this research study is built upon. Based on the literature review, the dependent variable has been identified as ‘RPA adoption by the Retail Banking Industry to enhance customer experience’. The various independent variables (which are factors influencing the dependent variable) have been identified as: 1) Security and Privacy; 2) Reliability; 3) Usefulness 4) Human-like interaction. A relationship between these variables has been established to create the research model so that we are able to further the role of each of these factors in influencing the adoption of RPA by retail banks to enhance customer experience. RPA are the alternative investments for bank to deal with higher volume at lower cost and remain competitive in the banking industry. It is the future of customer service. AI and the advancement in robots made the financial services more efficient including Credit risk checking, fraud detection, robot advisor and analyst. Roboadvisors are a major technological disruptor for traditional wealth management. Banks are investing in RPA to expand the service and starting a trend to pay attention in creating an ideal customer experience, generational difference and expectation. Customers have become more demanding for prompt and reliable services. Security and privacy are one of the important factors that influence customer experience. Based on literature reading, security and privacy are the primary concerns of customers in adopting the banking service . Perception of internet security influence the customers’ expectation, trust, adoption and use of internet banking service . Banking chat bots and facial recognition security may be something that customers are looking for in 2017 . Innovation depends on large data collection; big data is a new source of immense economic and social value [14,15]. Customers are more concerned about security and privacy of their personal data, transaction, fraud and social threat of processing customers’ online available data for discriminative purposes [16-18]. AI has become an effective tool of Cybercrime detection and prevention . Business intelligence techniques allow reducing cost by managing risk and preventing fraud . Security and Privacy is positively related to reliability, usage and adoption . Hypothesis 1 (H1): A better protected, secured and privacy banking solutions (by using RPA) are positively related to customer experience. Hypothesis 2 (H2): Security and Privacy improvements (by using RPA) are positively related to automation and human-like interaction. Hypothesis 4 (H4): Security and privacy (by using RPA) is positively related to the data and usefulness of banking products and services. Reliability and ease of use influence customer experience after security and privacy . RPA can be utilized to unify their investment advice globally to improve credibility, increase regulatory compliance, efficiency and customer satisfaction [8,22]. RPA is cost-effective; the automation software reduces the bank’s processing costs by 80 percent . RPA allows low incident of error and improved business processes . Customers’ satisfaction is influenced by prompt service, appearance, technological service, responsiveness, reliability and trustworthiness satisfaction . Software robot can work 24 hours a day, seven days a week, and 365 days a year . For a customer agent who is searching for a financial product that best meets their need, Bot can autonomously accomplish this task by searching the relevant information and answering specific questions promptly . RPA can improve credibility by unifying the investment advice of banks. It can minimize or eliminate error and provide customized solution to customers. Also, a bot can operate 24/7 and hence improve reliability. The following hypotheses are based on the above discussion. Hypothesis 5 (H5): The reliability and availability (of customized products and services solution using RPA) is positively related to enhancing customer experience. Usefulness is the factor affecting continuance intention to use the Smartphone banking services . Data Mining is classification, clustering, association analysis, time series analysis, and outlier analysis. The biggest challenges are to access or extract large scale data, ensure security of sensitive information and to handle incomplete data . RPA combines automation with the adaptability and awareness of AI. Each task the robot executes produces data that, when gathered, allows for an analysis. This drives better decision-making in the areas of the processes being automated . Three reasons for embedding AI into user interface are to gain data analysis and insights, increase productivity and cost benefit savings . Customer prefers customized product and services from banks that suits their needs . RPA with AI can collect large data that can be analysed for better decisionmaking. Robo-advisors can utilize data to provide customized solution which can best suit the needs of customers, hence increase the usefulness of banking services. Usefulness of products and services affects the customer’s continuance intention to use the banking services. Hypothesis 6 (H6): Improved usefulness by data analytics and data mining (to customize products and services as per customer’s need using RPA) is positively related to customer experience. Customers prefer human interactions to complete their tasks. AI creates human-like customer experience and can be used to understand intentions and emotions of customers. It accelerates technology adoption . The human’s emotion about technology acceptance is the factor that determines early perceptions about the ease of use of a new system. Algorithms and apps could replace half of the banking jobs over the next 10 years [25,26]. AI can create outputs beyond what a human brain can . Wealthy individuals will always prefer to consult a human as their complex financing needs may not be easily replicated by a robo-adviser [2,27]. Banks deploy AI to deepen the understanding of customers by monitoring crowd sourcing complaints and develop sentimental analysis . Based on literature review we understand that AI cannot replace human completely in all the tasks but it can reduce its interaction dramatically to complete the task. It is able to read, learn and understand intentions and emotions of customers. It can create human-like interaction and experience, hence influence the customer experience. Hypothesis 7 (H7): The human-like interaction by implementing RPA is positively related to customer experience. AI brings in renewed focus on customer experience. Based on certain data inputs available from the customer history, personalized communications and advice, enabled by AI, can be reflected by Robot advisors. For example, online wealth management services that provide automated algorithm-based portfolio management advice without the help of a human counterpart. Many of the larger financial institutions globally are using AI to improve the personalized offers and communication. Going forward, it is believed that the banks will be focusing on custom marketing and solution development to improve the customer experience as well as increased revenue by offering customized products for targeted customers. The tedious process of handling and communicating with a new customer to the bank can now become a highly personalized interaction based on the individual’s activity post opening. This level of personalization was almost impossible to achieve without the benefits of machine learning and AI. (6) Disbursals and Payments – Individual or Corporate. The research model was tested using a survey questionnaire. The survey instrument was constructed by identifying relevant measurements from a comprehensive literature review. The questionnaire consisted of five parts; first four parts related to the four independent variables and the last part was on demographics. There were a total of 16 questions and a 5-point Likert scale was used to measure the survey items. An explanation on the subject and the purposes of the research were mentioned at the start of the survey for the better awareness of this study. In addition, the voluntary nature of the survey and the assurance of privacy of data were also stated. The questionnaires were circulated to banks’ customers, IT professionals, analysts and senior management decision-makers. We reached out to a target sample size of 150+ by providing an online link to the survey through email invitations. We also had discussions with RPA experts working on projects with banks. Secondary data had been taken from research reports, case studies, articles, and journals. For statistical analysis, the ADANCO, a software for variance based structural equation modelling (SEM) was used to construct the data model, run and validate the hypothesis testing, measure reliability of data, overall goodness of fit test and the assessment of discriminant validity. Out of a total of 150+ targeted customers, 112 responses were received. More than 50% of the participants performed banking transactions (Table 1) at least once in 4 months. Majority of the participants (Table 2) were from the Asia Pacific region (97%) while others were from America and Africa (3%). The primary role (Table 3) of these participants were Managers (28%), Consultant (21%), Analyst (21%) and Marketing/Sales (18%) working in (Table 4) Information technology (40%), Banking and Finance sector (21%). Their income (Table 5) was in the range of $50,000 - $100,000 (46%) and above $100,000 (28%). Majority of the participants (Table 6) were in the range of 25-35years (46%). Table 1: Frequency of banking transactions. In this analysis, we use Cronbach’s alpha to measure reliability or consistency of survey responses. There are different reports about the acceptable values of alpha, ranging from 0.70 to 0.95  (Cronbach, 1951). Litwin and Fink  suggested that value of Cronbach’s alpha should be higher than 0.7 while Chin,  suggest that a Cronbach’s alpha value of 0.6 is acceptable to confirm internal consistency. Joreskog’s rho (Pc) is used to measure composite reliability which checks how well a construct is measured by its assigned indicators. Composite reliability score for a good model should be more than 0.7 . Table 7 shows the score of reliability construct. Convergent Validity (Table 8) is used to examine correlation of construct and factor that are expected to be related, are in fact related. Average variance extracted (AVE) is greater than 0.5 implies that all independent variable related to dependent variable [33,34]. Discriminant validity (Table 9) is used to examine the correlation of construct and factor loading that have no relationship. When the square root of each construct’s average variance extracted (AVE) is greater than correlation of the construct to other latent variable, the correlation of construct demonstrates discriminant validity. For adequate discriminant validity, diagonal elements should be greater than corresponding off-diagonal elements [35,36]. This statistical model (Tables 10 and 11) describes how well it fits a set of observation. It measures the discrepancy between observed value and the value expected under the model is question. SRMR value of Goodness of model fit should be less than 0.08 . The table below (Table 10) shows SRMR value of 0.0806 for saturated model which indicates that this model is close to good fit. Table 10: Goodness of model fit saturated model. Table 11: Goodness of model fit estimated model. SEM/ path analysis (Figure 2) is a statistical technique that is used to analyze causal relationship between two or more variable. Pathway in model represents hypotheses of researchers. SEM deals with measured and latent variable. A measure variable is variable that can be observed directly and is measurable. A latent variable is a variable that cannot be observed directly and must be inferred from measured variable . Figure 2: Structural equation model with path coefficient. In Figure 2, R2 value of user experience (UE) from RPA in banking service is 0.714, which indicates 71.4% of the dependent variable (User Experience) is from independent variable (Security and privacy (HS), Reliability and Availability (HR), Data and usefulness (HD) and Human-like Interaction (HL)). The value of R2=0.714 is acceptable . Finally, boot strapping is applied to perform inference statistic for all parameter or hypotheses on structural equation model. Bootstrapping provides tvalue for weight or measure the significance Below (Table 12) is the level of t-value significance. Table 12: Bootstrap level of significance. Structural equation model or path analysis are used to perform hypothesis testing (Table 13). A total of 7 hypotheses were tested, out of which 6 were supported very strongly. Seventh hypotheses also supported but its confidence interval was slightly lower than the others. Table 13 Hypothesis testing results. Hypothesis 1(H1) highlights the influence of a better protected secured and privacy banking solutions (by using AI and RPA) on user experience. Its t-value=8.5859; CI>99%; thus H1 (β=0.199; p<0.01) is accepted. This indicates that security and privacy are positively related to user experience. This is in accordance with earlier studies , but as per this research reliability (β=0.382) is the primary concern however above reading suggest security and privacy is the primary concern of the users. However, total effect including direct effects of security and privacy on user experience is 0.6775. Hypothesis 2 (H2) highlights the influence of security and privacy improvements (by using AI and RPA) on human-like interaction. Its t-value=6.4668; CI>99%; thus H1 (β=0.488; p<0.01) is accepted. This indicates that security and privacy are positively related to automation and human-like interaction. This is accordance with earlier studies . Hypothesis 3 (H3) highlights the influence of security and privacy (by using AI and RPA) on reliability. Its t-value=6.1583; CI>99%; thus H1 (β=0.567; p<0.01) is accepted. This indicates that security and privacy are positively related to reliability of banking product and service. This is accordance with earlier studies security and privacy is positively related to a better and solid reliability . Hypothesis 4 (H4) highlights the influence of security and privacy (by using AI and RPA) on usefulness. Its t-value=6.5726; CI>99%; thus H1 (β=0.583; p<0.01) is accepted. This indicates that security and privacy are positively related to the usefulness of banking product and service. This is accordance with earlier studies security and privacy is positively related to the usage and adoption . Hypothesis 5 (H5) highlights the influence of reliability (with customized product and service solution using AI and RPA) on user experience. Its t-value=5.3936; CI>99%; thus H1 (β=0.382; p<0.01) is accepted. This indicates that reliability is positively related to enhancing user experience. This is accordance with earlier studies , but as per this research reliability (β=0.382) is primary factor influence user experience. Hypothesis 6 (H6) highlights the influence of usefulness by improved data analytics and data mining (to customize product and services as per customer’s need using AI and RPA) on user experience. Its t-value=3.7819; CI>99%; thus H1 (β=0.2995; p <0.01) is accepted. This indicates that usefulness is positively related to user experience. This is accordance with earlier studies . Hypothesis 7 (H7) highlights the influence of human-like interaction by implementing AI and RPA on user experience. Its t-value=2.379; CI>95%; thus H1 (β=0.174; p<0.05) is accepted. This indicates that human-like interaction is positively related to user experience. This is accordance with earlier studies [25,26]. The research findings provide insights to the bank on how the adoption of RPA will impact the customer experience in the retail banking industry. The main objective of banks is to remain competitive and increase their profitability at lower cost. One of the ways they can achieve this is by introducing RPA for their daily operations. RPA replaces work performed by people; which are high in volume and repetitive. These are better performed by Robots which reduces delivery time and hence provide cost effective operations . The successful adoption of this new technology can also be part of a bank’s competitive strategy which in turn will bring benefits to the bank and its customers. Customers demand reliable and fast service. AI and RPA can provide prompt service solutions 24 hours a day, seven days a week, and 365 days a year [8,22]. Thus, overcoming the constraint of a human, RPA will eliminate or minimize complications with time-zone differences, cultural and language barriers. This will enhance customer experience as a customer is able to get the service from bank anytime anywhere as per their schedule. The research found that reliability and availability (0.382) had the highest influence on customer experience due to the implementation of RPA. Integrating control, intrinsic motivation, and emotion into the technology acceptance model are the factors that determine early perceptions about the ease of use of a new system . This is indicated by data and usefulness (0.299). Security and privacy (0.199) followed by human-like interaction (0.174). Customers’ perception of banking services is changing with rapid advancement and changes in technology. It is necessary for the banking industry to meet and understand customers’ expectations and to enhance their overall experience. Customers want customized products, prompt services, irrespective of location and time barrier, assurance of security and protection to their personal data and lower costs without compromise on quality of service. Therefore, it becomes crucial for banks to pay attention to these factors and enhance customers’ experience while adopting and implementing new technologies such as RPA across banking functions and processes. Despite the much-hyped expectation in terms of value delivery by RPA technology, and increasing use cases, there is still slack in the mainstream adoption of RPA technology in the banking industry. Literature in the past, done from the customer perspective, suggests that the perceived usefulness and perceived ease of use of any new technology are important factors for its adoption. It is not only important to understand the factors which influence the adoption intentions of RPA, but it is imperative to understand the ways in which a bank can address and handle such factors to build a business model to increase its overall value delivery efficiency and gain competitive advantage. This research is predicated on these significant theoretical and practical problems related to RPA adoption. Our current study examines four factors that influence adoption of RPA in the retail banking industry, namely security and privacy, reliability, usefulness, human-like interaction. The paper outlines some important implications for both research and practice. First, the current state of RPA research in the Information Systems (IS) field is sparse. The application of RPA in the financial service sector is gathering pace but most banks are still in the early stages of its adoption. This research augments insights from IS by understanding the customer acceptance and adoption of this innovative technology. As RPA research in the domain of IS is sparse, this study contributes theoretically by setting the foundation for future research in this area. Second, the study highlights the factors that can influence the adoption intentions of technologies like RPA. We extend the literature on different factors along with literature on RPA itself by presenting a research model (Figure 1) that provides a theoretical basis for understanding the antecedents of adoption intentions in the context of RPA. Future research can examine these characteristics in depth to expand the list. Third, the research presents a research model (Figure 1). This model can be used to study the adoption of other technologies for the retail banking industry. In addition to having implications for research, the study has various important implications for the banks, its customers, IT professionals, analysts and senior management decision-makers. First, though 21st Century is a technology driven era and banks are trying to innovate to survive in the cut-throat competition, the RPA technology is one area that holds plenty of potential and still not tapped to the fullest. The current study is predicated on this gap. This paper emphasizes the significance of RPA technologies and what factors banks should consider to facilitate the easy adoption of this interactive technology to enhance customer experience. Second, the study unambiguously highlights factors that are key drivers for the adoption of RPA and urges banks, senior management decision-makers, to seriously consider these factors for successful adoption of RPA for better value delivery. The study emphasises that security and privacy is the primary concern of the customers and is positively related to automation and human-like interaction as well as reliability of banking products and services. So, there is a need to increase the focus on security and privacy while integrating RPA into the retail banking industry. The reliability of customised products and services is a key factor influencing customer experience. Such customised products and services can be created through improved data analytics and data mining. Human-like interaction is another important factor that would enhance customer experience. This research mainly focused on collecting data within Asia Pacific, 97% of responses were from the Asia Pacific region. This can be further expanded by collecting data from other regions such as America, Europe and Africa. This research focused on factors that influence customer experience, data security and privacy, reliability, availability, data mining and usefulness. It can be further researched on other factors such as ease of use, solution stability and robustness, optimization of resources and employee productivity. Robotic Process Automation (RPA) is increasingly a strategic priority for banks to maintain competitive advantage and increase profitability. The research proposes and tests the adoption of RPA in the retail banking sector to enhance customer experience. The conceptualization of factors influencing the adoption intention provides direction to banks, IT professionals and senior management decision makers, technology practitioners and researchers to focus on the customer perspective. Furthermore, the structural model examination validated the relationship between various proposed factors and the adoption intention of RPA, thereby highlighting the serious need to devise effective strategies for successful adoption and value creation through the technology. The results of the structural relationship can serve as a starting point for banks to formulate their strategies around the prominent factors, including security and privacy, reliability, usefulness and humanlike interaction. The paper provides several directions for researchers for further studies in this focus area of the adoption, implementation, and impact of a potentially beneficial RPA technology. The authors would like to thank Ankur Gupta and Meeta Garg for their involvement and support during the various stages of this study. Bank of America Merrill Lynch (2015) Thematic Investing - Robot Revolution: Global Robot and AI Primer. Morrow R (2016) Private banks' robotic evolution. FinanceAsia. Casale F, Dilla R, Jaynes H, Livingston l, Matrisciani M (2015) Introduction to Robotic Process Automation: A Primer. Institute for Robotic Process Automation. Daga M (2016) Using Advanced Analytics to Improve the Customer Experience. Bank Director. Chavan J, Ahmad F (2013) Factors affecting on customer satisfaction in retail banking: An empirical study. International Journal of Business and Management Invention 2: 55-62. Frame WS, White LJ (2014) Technological change, financial innovation, and diffusion in banking. The Oxford Handbook of Banking 271. Zeinalizadeh N, Shojaie AA, Shariatmadari M (2015) Modeling and analysis of bank customer satisfaction using neural networks approach. International Journal of Bank Marketing 33: 717-732. Kim JB, Kang S (2012) A study on the factors affecting the intention to use smartphone banking: The differences between the transactions of account check and account transfer. International Journal of Multimedia and Ubiquitous Engineering 7: 87-96. Shaikh AA, Karjaluoto H (2015) Mobile banking adoption: A literature review. Telematics and Informatics 32: 129-142. Svilar A, Zupancic J (2016) User experience with security elements in internet and mobile banking. Organizacija 49: 251-260. Rondovic B, Dragasevic Z, Rakocevic S (2016) Ranking of user expectations which influence the level of adoption and use of internet banking service. Economic and Social Development: Book of Proceedings 100. Adebisi M (2016) Act quickly OR BE swallowed up. Texas Banking 105: 8-11. Jing Q, Vasilakos AV, Wan J, Lu J, Qiu D (2014) Security of the internet of things: Perspectives and challenges. Wireless Networks 20: 2481-2501. Chen F, Deng P, Wan J, Zhang D, Vasilakos AV, Rong X (2015) Data mining for the internet of things: literature review and challenges. International Journal of Distributed Sensor Networks 11: 431047. Kandias M, Mitrou L, Stavrou V, Gritzalis D (2013) Which side are you on? A new Panopticon vs. privacy. Security and Cryptography (SECRYPT), pp: 1-13. Susanto A, Chang Y, Ha Y (2016) Determinants of continuance intention to use the smartphone banking services: An extension to the expectation-confirmation model. Industrial Management and Data Systems 116: 508-525. Dilek S, Cakir H, Aydin M (2015) Applications of artificial intelligence techniques to combating cyber crimes: A review. arXiv preprint arXiv. Panja R, Paul S (2014) A Review Report on the Evolution and Implementation of Business Intelligence Technique in the Banking Sector. International Journal of Computer Science and Mobile Applications 2: 109-114. Gupta P, Seetharaman A, Raj JR (2013) The usage and adoption of cloud computing by small and medium businesses. International Journal of Information Management 33: 861-874. Willcocks LP, Lacity M, Craig A (2015) Robotic process automation at Xchanging. Ginovsky J (2001) Bricks can excel at clicks. ABA Bankers News 9. Accenture (2017) Bankers believe artificial intelligence is key to creating a more-human customer experience, according to Accenture report. Accenture Newsroom. Rohde F (2016) the changing role of artificial intelligence and person-to-person interactions in retail banking. PRWeb. Venkatesh V (2000) Determinants of perceived ease of use: Integrating control, intrinsic motivation, and emotion into the technology acceptance model. Information Systems Research 11: 342-365. Neal RW (2016) Beyond robos. Wealth Management. Sposito S (2012) Banks deploy Artificial Intelligence to deepen understanding of customers. American Banker. Cronbach LJ (1951) Coefficient alpha and the internal structure of tests. Psychometrika 16: 297-334. Litwin MS, Fink A (1995) How to measure survey reliability and validity. Sage. Chin WW (1998) Commentary: Issues and opinion on structural equation modeling. Chin WW (1998) The partial least squares approach to structural equation modeling. Modern Methods for Business Research 295: 295-336. Campbell DT, Fiske DW (1959) Convergent and discriminant validation by the multitrait-multimethod matrix. Psychological Bulletin 56: 81. Carlson KD, Herdman AO (2012) Understanding the impact of convergent validity on research results. Organizational Research Methods 15: 17-32. Fornell C, Larcker DF (1981) Structural equation models with unobservable variables and measurement error: Algebra and statistics. Journal of Marketing Research, pp: 382-388. Thatcher JB, Perrewe PL (2002) An empirical examination of individual traits as antecedents to computer anxiety and computer self-efficacy. MIS Quarterly, pp: 381-396. Hu LT, Bentler PM (1999) Cutoff criteria for fit indexes in covariance structure analysis: Conventional criteria versus new alternatives. Structural Equation Modeling: A Multidisciplinary Journal 6: 1-55. 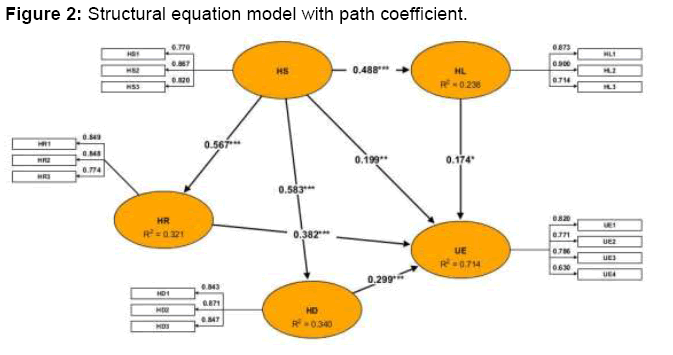 Stoelting R (2002) Structural equation modeling/path analysis. Hooper D, Coughlan J, Mullen M (2008) Structural equation modelling: Guidelines for determining model fit. Articles 2.